The eight elders for the 2012-13 church year meet with Pastor Terrye at least once a month to discuss the church community and its ministry programs. 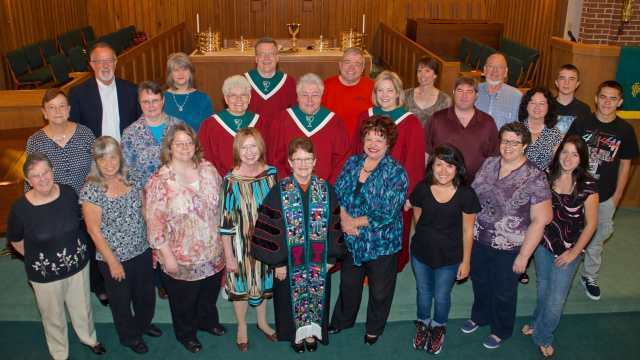 Seated from left-to-right are: Bill Keatley, Sara Snowden, Jean Putnam, Deb Whitley, Patrick Simpson, Gail Kent, Pastor Terrye, and Gina Stump (Elder Chair). Not available for this photo was Tony Newbill. A large floral cross on Easter Sunday is a popular Lenten tradition of the church. Church members decorate the cross with flowers from their respective gardens and the cross is displayed in the sanctuary for the Easter Sunday services. Church sign and flower garden visible from the corner of Warwick Boulevard and James River Drive. Pastor Terrye expressing a point during a recent class. Detail of the colorful needlepoint depicting "The Last Supper" displayed in the church Narthex. The artwork was presented to the church on Easter Sunday 2010 in memory of Elmer B. and Eleanor S. Givens.